One of the biggest musical tragedies of the last few years was when the band Statues decided to pack it in. Sadly I never got to see the band that put out one of my favorite albums of the 2000's play a show. Their album New People Make Us Nervous is essential and if you don't already own it, I suggest you stop what you're doing right now and go find a copy. Needless to say I was pretty darn excited when I discovered that Rob from Statues had a new band called der Faden. That excitement was tempered by the fear that the new band might try to be completely different from what made Statues so great. I've seen it before. Dude is in a great band, band breaks up, dude starts a new band that is terrible. Just ask Eric Bachmann. Luckily der Faden doesn't fall into this problem. While certainly not a carbon copy of Statues, the two songs on this 7" have enough similarities to keep existing fans happy. A-side "Best Guess" catchy with a mid-tempo start/stop guitar riff that breaks into a sing along chorus. It doesn't have quite the punch as some of the Statues songs had, but it's a strong first impression. On the flip side we have "Filaments." It's a bit more straight forward than "Best Guess," built on downstroke guitar blasts and Rob's distinctive vocals. 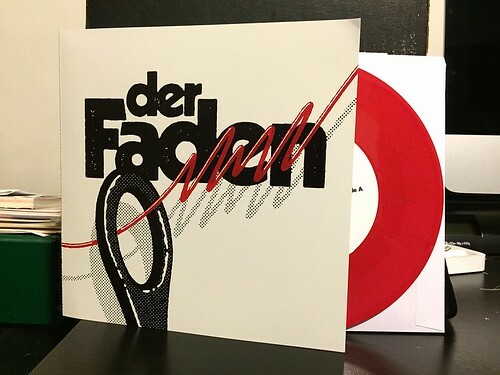 This 7" is a solid first showing from der Faden. Both songs are quite good, though they both leave me wanting to hear more for the band. To me they feel a bit like the two slower songs you'd mix into an album full of fast paced attacks. I'm not sure what the future holds for der Faden. Maybe they've got some burners being worked on or maybe they're going to try to keep things at this pace. Regardless, I'm pretty thrilled Rob is making music again and I'm eager to see what comes next.